With energy prices rising steadily, nuclear power is reviving. The number of reactors worldwide is now 315, jumping by 93 (42%) in 2007. 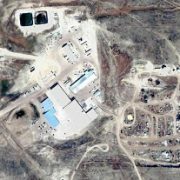 So it’s no surprise that uranium mining is booming. Thousands of new uranium mining claims have been staked across the US in the past few years, existing uranium mines are ramping up production, defunct mines are being re-opened, and new mine proposals crop up like mushrooms (hmmm…. ), especially in the Western US, even along the rim of the Grand Canyon. It’s good to remember that it’s not just nuclear waste that’s a serious problem; the mining, processing and transport of uranium can get ugly too. 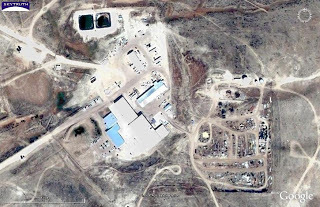 Case in point: an in-situ uranium mine near Douglas Wyoming — touted by industry and government officials as a model for modern uranium-mining techniques — is now being investigated for “an alarming volume of environmental violations.” Take a look at our Google Earth-generated pics of the site (showing what appears to be an open dumpsite next to the main facility, with open ponds and trenches containing water or other liquids). Earth users, download our KMZ to take your own self-guided tour. Try your hand at image analysis, and let us know what you think is going on at this site. I work at the WestWind Foundation, a family foundation based in Charlottesville, Virginia, that provides support to non-profits working to stop mountaintop removal coal mining. WestWind has supported SkyTruth since 2004. Before coming to WestWind, I knew little of the technical analysis performed by SkyTruth. But in the past year, I have learned something of the destruction being wrought everyday upon the southern Appalachian mountains. Blasting off the tops of mountains to extract coal contributes to groundwater contamination and health problems, disrupts the lives of local people living with constant detonation, fills in hundreds of miles of streams, and destroys the ecological heritage of one of the most biologically diverse regions of the country. At first, I wondered how a picture from space could possibly capture all the destruction, devastation, pain, and injustice that is caused by this type of coal mining. When I had the opportunity to view SkyTruth’s maps and images, and to learn exactly what their modeling and analysis could show, I was amazed. David, John and their team have uncovered and mapped the extent of mountaintop removal mining in the southern Appalachians, something that has never before been undertaken by government or industry (let alone a small non-profit). I watched, amazed, as David showed how the devastation has advanced over a thirty-year period, devouring a majority of the land area within certain counties in southwestern Virginia and eastern Kentucky. Although the data and the maps are impressive, they alone are not what make SkyTruth’s work successful and engaging. The partnership between SkyTruth and Appalachian Voices is a truly unique relationship between science and the grassroots, and between data analysis and story-telling. Appalachian Voices has built a revolutionary website that allows anyone in the country to input their zip code and trace their energy utility’s use of mountaintop removal coal. SkyTruth provides the technical data and maps that show which mountains have been destroyed; Appalachian Voices provides the human stories behind the devastation. Both strategies are necessary to end this kind of ecological and community destruction. What continues to impress me about SkyTruth is that this kind of behind-the-scenes advocacy is not limited to southern Appalachian coal communities. SkyTruth works to illustrate the impacts of natural gas drilling in Wyoming; diamond mining in Canada; oil and tar sands in Canada, Australia, and Colorado; trawling in the Gulf of Mexico, and the list goes on. What lies at the heart of SkyTruth’s mission is a deep concern for the planet’s shared ecological commons, and the commitment to bringing images of their destruction to the public. What could become one of the world’s biggest open-pit gold mines, called the Pebble Mine, is being proposed in southwest Alaska. Opponents of the plan, including sportsmen, commercial fisherman, many native Alaskans, and former Alaska governor Jim Hammond, are concerned that the mine could affect the economically important wild-salmon fishing and tourism industries. 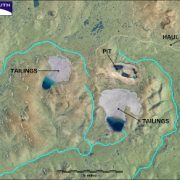 The mine site is located in the headwaters of streams flowing into Lake Iliamana and Bristol Bay. 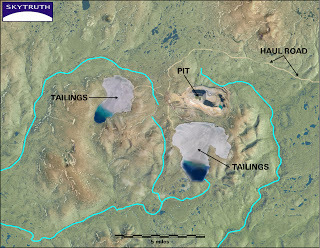 SkyTruth has generated a gallery of satellite images showing what the mine site looks like now, and a series of simulations based on several versions of the mine development plan that have been published by the mining company, Northern Dynasty. A tip o’ the hat to one of SkyTruth’s talented volunteers, Andrew Vernon, who produced this simulation showing the most recent plan. And another nod to Erin and Hig McKittrick for their excellent Pebble Mine website, including a blog, photo gallery, and interactive Google map of the Pebble Mine site and surrounding area. All in all, this is an outstanding example of the “ground truth” comment Paul discussed a few days ago. Expect to see a whole lot more of this in 2008!